Combining style and minimalism with an affordable price is a great concept, and the Ninebot by Segway ES2 does this perfectly. It’s an upgraded model from another successful electric scooter (ES1), but it has added extras and some beneficial features that users can definitely try out. The ES2 stormed the market when it was released as it was one of the greatest things to happen in the e-scooter industry due to the improvements and price. It offers extreme power and an aesthetically pleasing design – what more could you want from such a great piece of technology? It’s easy to dismantle and take on your travels since it’s lightweight (coming in at only 28 pounds!) but it doesn’t look cheap when it’s all set up and ready to be ridden. The scooter even has colorful LED lights on the bottom which are a great addition, something that most luxurious scooters have but budget one’s lack. It’s the perfect balance of design, quality, and cost which is ideal for most buyers. 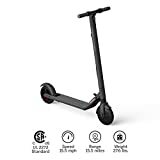 For those of you who don’t want to spend a full paycheck on an e-scooter, this is the perfect alternative to other models as it’s a fraction of their prices. 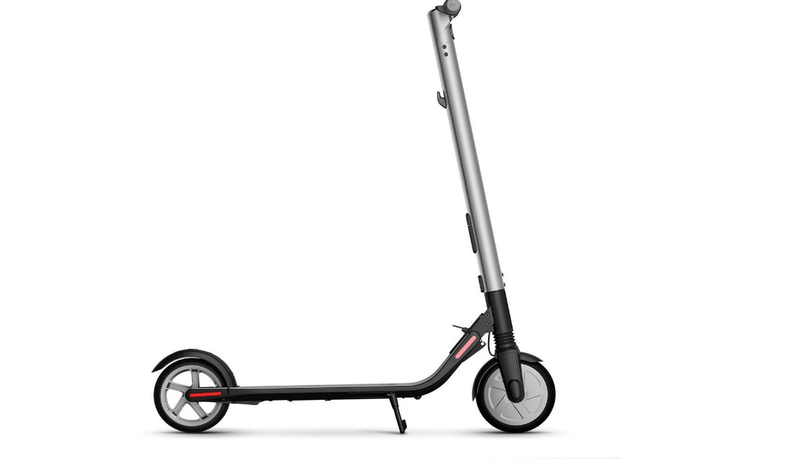 The body of the e-scooter is very sleek and simple. It has the classic and smooth deck lines which transfer into a larger steering rack and handles. This is where the battery, modules, and wires are stored (which is which it’s pretty wide). When looking at the bottom of the scooter you may possibly ask where everything technological is stored, well it’s all stored compactly in the coating of the handlebars. The ES2 has an aluminum alloy body which allows it to be lightweight but very strong at the same time. However, the deck is covered with a silicone grip for a reliable support system when you’re wearing shoes. You can use this scooter while you’re not wearing shoes (perhaps with socks or barefoot) but this isn’t ideal as it would reduce the grip you have on the deck bottom. Even in the wet weather, the foot pads on the deck of the scooter don’t become slippery since the surface is highly resistant. Despite it not being recommended to wear slippery footwear, you can still happily and safely brake, accelerate and corner the scooter without any issues. The bottom of the deck is mounted with LED-lights with the rear of the deck having visible lights for braking in the dark. These lights are ideal if you’re in need of headlights or want to ride your scooter in the dark. It’s the perfect alternative to a motorcycle or car as you get to feel the wind in your face! One element of the body we particularly like is that the whole scooter folds down, and the fact that you can easily see the LCD display (which tells you your speed, battery level and time) with any issues. The Bluetooth is a nice touch by Ninebot as it allows you to connect your smartphone to adjust settings on the scooter. This gives you a lot more freedom and control of your e-scooter which is a quality that budget scooters often lack. Having these simple yet useful features make for a smarter and more sophisticated e-scooter that the whole family will love. Don’t worry about the wheels of your scooter getting punctured as the ES2 has cast-iron wheels that are still comfortable to ride but ensure for a safer and more efficient ride. There is also no need to carry a pump to pump up your tires which is always a great aspect! The scooter is also equipped with a footrest that elegantly sits the scooter upright and is strong enough to keep it in a vertical position for as long as you need. You may not initially see the footrest as it is tucked away behind the front wheel, but when you discover it, it will be a life changer in terms of storage of your scooter. Due to the wheels being unusually strong, and the motor of the battery being powerful. The scooter is able to reach up to 15 miles an hour (25km) meaning you can get to your proposed destination faster and eco-friendlier than ever. You won’t be putting harmful fumes into the air, and you’ll have fun too. What more could you ask for? We think it’s very little. As well as this, there are LED-lights above the wheels allowing you and others around the roads and pathways to see you while you’re zooming past. However, despite being a strong iron metal, the wheels are still lightweight and easy to store away with the body of the scooter. Previously in this review, we stated that the scooter is lightweight, but how lightweight is that? 28 pounds to be exact. The battery is lithium iron so doesn’t take up a lot of weight, and the wheels are generally the heaviest part of the scooter overall, and they’re even pretty light to touch and carry around. The weight of this scooter and its ability to fold up means you’re able to place in it in a travel bag and carry it around wherever you wish. That is something you often can’t do with any e-scooter never mind one that is so affordable. There are generally two sizes of the scooter, it’s folded size and the size it is when it’s fully rideable for any user. The unfolded size is 40” x 17” x 45”, whereas the folded size is significantly less than this at 45” x 17” x 16”. It is also important to note that the handlebar rack height is not adjustable according to the height of the user, so it will not change. This doesn’t mean there are no significant changes in the size and the folded size doesn’t change at all. The battery has a power of 700W with a capacity of 5.2Ah and a charging time of 3 hours. However, there is the ability to upgrade the scooter using an external battery. Although this would add a small amount onto the price, you can do this after your purchase. Adding this external battery would allow you to go faster than before and the charger is more efficient. 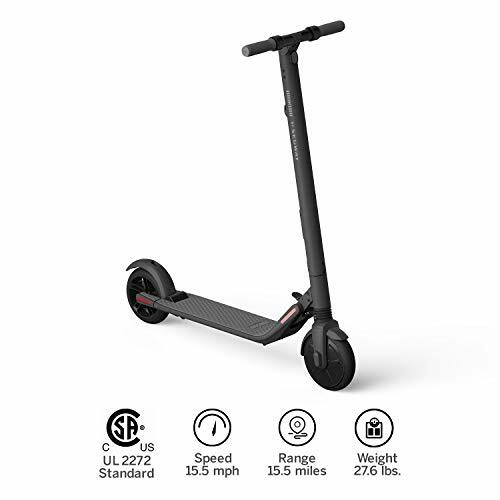 One of the only disadvantages of this would be that the scooter would be heavier in weight if an added battery were on its body or rack. According to the official website, the warranty for this ES2 is limited. This means that although the company will cover you for certain aspects of damage or manufacturing errors, it won’t cover everything. It’s always ideal to check out the warranty of a product with the company you buy it from before purchasing as it could have no warranty or one that is only valid for a few days/months. Luckily, the limited warranty for the ES2 excludes any damage caused by abuse, misuse or neglect and also improper charging and storage. It mainly covers manufacturing errors or those to do with the battery. 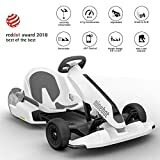 Other customer reviews have previously stated that the customer service with Ninebot had been great so don’t worry if something goes wrong with your e-scooter they should be able to help. There aren’t any particular restrictions except the typical; age and height. You must be 14 years old or older to ride this e-scooter, but this is standard across most e-scooter brands and especially pieces of ridable technology. The weight restrictions are 100kg which is also another standard for most e-scooters out there. This is to ensure all users and riders can the best experiences with their ride. Those with heart problems, are pregnant or suffer from serious anxiety are advised not to ride the scooter as it can be dangerous for them. There is no maximum age limit for the e-scooter but the company trust that users can make a judgment on who is suitable in age for this scooter. There are so many great elements of this e-scooter. From the powerful, removable battery, to the fact that you can choose between two sleek design colors (silver or black). We don’t know what our favorite aspect of the ES2 is, but we know it’s something that is definitely affordable for those who like e-scooters and it’s the perfect present for a teenager who wants to try out something new. The mix of quality and design is something that allows the Ninebot by Segway series to stand out as well as the sleek body and rack of this model. There is practically nothing we would want to change when considering all the elements and extra feature of the ES2 which is a rarity considering how many great e-scooter models there are available on the market.